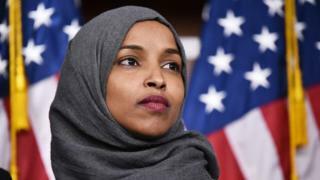 The US House of Representatives has voted to condemn "hateful expressions of intolerance" amid a row over anti-Semitism. Minnesota congresswoman Ilhan Omar has prompted sharp objections recently for frequently criticising Israel and pro-Israel lobbyists in Washington. Her Democratic party was split over how and whether to censure the freshman lawmaker. Speaker Nancy Pelosi has denied the resolution was made to rebuke Ms Omar. "It's not about her. It's about these forms of hatred," Ms Pelosi told reporters, denying suggestions the measure was "policing the speech of our members". Ms Pelosi has previously said she does not believe Ms Omar understood "the weight of her words". The Democratic-controlled House voted 407-23 in favour of the resolution condemning discrimination against Jewish people, Muslims, Latinos and other minorities. Some Democrats had pushed for a vote purely condemning anti-Semitism, but the resolution was broad and did not mention Ms Omar by name. Speaking at an event on Friday, the congresswoman questioned what she termed "the political influence in this country that says it is OK for people to push for allegiance to a foreign country", in reference to pro-Israel lobbying. Critics from both parties attacked the 37-year-old, saying her comments revived anti-Semitic tropes of Jewish Americans having divided loyalties. New York's Democratic Mayor Bill de Blasio called the remarks "absolutely unacceptable" and "illogical". "Unfortunately, it aligns with a history - for centuries - of that kind of negative comment being thrown at the Jewish community," he said at a press conference. US President Donald Trump also criticised Ms Omar, saying she was again "under fire for her terrible comments concerning Israel". But others have come to Ms Omar's defence. Presidential candidate Bernie Sanders - himself Jewish - said in a statement on Wednesday that he feared the House vote was to target the congresswoman "as a way of stifling debate", saying people should not "equate anti-Semitism with legitimate criticism of the right-wing, Netanyahu government in Israel". Fellow candidates Kamala Harris and Elizabeth Warren also spoke out in her favour, with Ms Harris calling for "a sound, respectful discussion about policy". Ms Omar, the first Somali-American in Congress, has faced accusations of anti-Semitism before. In February she was criticised for tweets suggesting the American Israel Public Affairs Committee (Aipac) was buying influence for pro-Israel policies. She later tweeted an apology, saying she was grateful for her colleagues "educating me on the painful history of anti-Semitic tropes".